Team Sahlen entered their 1st race of the year with high hopes of staring off the season with success. The off season has seen Team Sahlen work to make several enhancements to their Porsche Caymans. Then as spring dawned, Team Sahlen ventured to nearby Dragway 42 for a duo of pre-race shake downs. The competition has continued to heat up in the American Endurance Racing Series. A full field of 80 entries saw over 20 cars in Class 5 (Overall Class) where Team Sahlen would be competing within. For qualifying, Team Sahlen was able to secure 3rd, 8th and 11th on the grid. Saturday morning saw sunny, clear skies for the start of the 9 hour endurance event. Team Sahlen was patient at the start of the race, managing traffic in the early hours of the race. As the race neared the mid-point, Team Sahlen had risen to the front of the pack, leading many times. As the race drew to the last hour, an on track incident saw the race be red flagged. This presented a very interesting last 30 minutes of the race. Team Sahlen had completed all their pit stops and was sitting in 3rd place. 1st and 2nd in the race still had one pit stop to complete. As the race went back to green, Team Sahlen had to make quick pace to ensure that the #41 Porsche Cayman would be able to overtake 1st and 2nd while they pitted. In the end of the race, Team Sahlen won the race by a scant 14 second margin. Sunday dawned with even brighter and warmer skies than the day before. Team Sahlen started from pole position due to the prior day victory. The 9 hour race started with lots of intense action, that included several incidents by Team Sahlen’s top competitors. 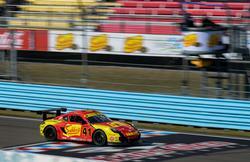 Team Sahlen worked hard to keep Porsche Cayman clean from contact and turning consistently fast lap times. Joe Sahlen drove over 4 hours of the race and placed the #41 Porsche Cayman into the lead. As the race wound down to the last 30 minutes, and intense battle assumed as Team Sahlen raced pro driver Randy Pobst in a BMW. The checkered flag flew, and nail biter finish concluded with Team Sahlen taking the victory by the narrowest of margins; 1.5 seconds. Team Sahlen’s Overall Victories on both Saturday and Sunday saw the team awarded the Overall Weekend Class 5 Award for best combined race results. Additionally, the 2 Victories brought Team Sahlen’s tally to 9 Overall Race Victories in the American Endurance Racing series. The next event for Team Sahlen will be the Sahlen’s Champyard DOG at the Glen to be held on Memorial Day weekend. Team Sahlen will be racing their Mazda RX-7s in the ChampCar Endurance Series dual 7 hour endurance events. honeybeeBase.com, eEuroparts.com, Tarett Engineering, Guard Transmission, Porsche of Beachwood, Pittsburgh International Race Complex, HubstandsPRO, Brothers Grimm Landscaping, NGK Spark Plugs, CM Racing Products, Mothers Polish and Wax, Grassroots Motorsports Magazine, Design Engineering Inc., Hard Brakes, Forgeline Wheels, Lamin-X, Optima Batteries, Mazdaspeed, MSI Racing Products, Winding Road Racing and WIX Filters.